Trabolgan has established itself as one of Corks & Irelands most popular School Tours and Day Group Outing destinations for all kinds of groups and are proud winners of the Primary Times Star Award three years in a row for one of the Best School Tours for the South of Ireland (as voted by readers of Primary Times). We have launched our 2019 programme for School Tours and Group Outings. Whatever type of adventure activities you are looking for, we are sure our fantastic range of activities for toddlers, kids and teens will not disappoint! From hands-on adventures, birthday party entertainment ideas through to abseiling and Combat Laser, we are sure to delight and enthral! 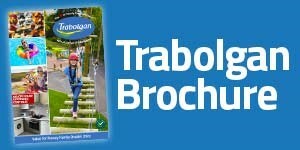 With two super Adventure Day pakages to choose from, there's something for every group at Trabolgan Holiday Village. Create your group's perfect adventure day with our Woodland Day Package.